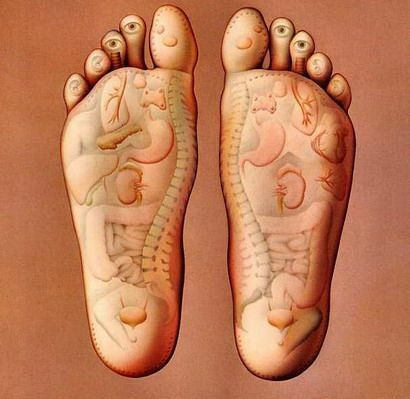 Reflexology brings about a state of relaxation and assists the body’s natural healing ability. It can complement other types of health care or it can be used for stress reduction. What will my reflexology session be like? A session lasts 50-60 minutes. You can either lie on massage table or sit in a recliner chair, whichever is most comfortable for you. You can relax and enjoy the session much like you would a massage. Wear loose fitting clothing so you are comfortable and breathe easily. If you wear pants, it is helpful if they can be pulled up toward the knee so the leg is exposed. A massage oil is used containing coconut or other carrier oil with cedarwood, fennel, geranium, lavender, lemongrass, orange, peppermint, juniper, wintergreen, marjoram and rosemary. These oils are beneficial for the skin, nerves, muscles, and tendons. Each foot is then “massaged” for about a half hour working the various systems and body parts. At the end of the session, most people are very relaxed and often sleep very soundly that evening. Some people experience a decrease in pain or improvement of symptoms. These effects may last for a few hours, days or longer. As each person is different, each person’s body reacts differently to treatment. For a condition that has lasted a long time, it may take a number of sessions before progress is seen. There is no guarantee that your symptoms will change, but I am constantly amazed at how the body can respond to even one reflexology session. It is important to drink a lot of water after a session as toxins that are stored in the feet are released and the lymphatic and circulatory systems transport these toxins to be disposed. A few people may experience flu-like symptoms the next day due to the body detoxing too quickly, however this is a rare occurrence. How often should I come for a session? For chronic conditions it is helpful to come weekly for a few sessions if that is possible. As the symptoms decrease, the time between sessions can be lengthened until the right fit is discovered for you. Some people come weekly, some come twice a month and other monthly or less frequently. For those who are healthy and using reflexology as a part of their preventive care plan, most come monthly. No. Reflexology is a non-invasive natural therapy that relaxes the body and is essentially harmless. On rare occasions, release of toxins as a result of the body’s natural healing process may result in symptoms such as perspiration, nausea or headaches, however these symptoms are not directly related to reflexology, and are temporary and not serious. No, reflexology should not be painful because the primary goal is relaxation. Some therapists have different ideas about how to work painful areas, but my goal is to make the session as pain free as possible. There may be areas on the foot that are tender and the pressure and techniques are adjusted as needed if your foot has tender spots. The pressure applied during a treatment is firm and as such the effect is generally not ticklish. Check out the Balance and Harmony services page for pricing and details on scheduling your appointment. Most policies do not cover reflexology and I do not file any paperwork with insurance companies. Payment is expected at the time services are delivered. Payment may be with a check or cash. Balance and Harmony does not accept credit cards.